The Indian Navy's Russian-built aircraft carrier Vikramaditya on Friday commenced sea trials in the White Sea. Severodvinsk residents will remember the night of 7-8 June, a “white” night on the White Sea at this time of the year. They came to bid farewell to the ship, which left the Sevmash fitting-out quay for sea trials; they got up a few hours early that morning to come to Yagrinski Beach to watch several trailers carefully tow the floating airfield with a 10-metre draft along the narrow outlet canal. The biggest contract in the history of Indian-Russian military and technical cooperation for upgrading the Russian aircraft carrier Admiral Gorshkov, currently INS Vikramaditya, for the Indian Navy, has entered its final phase. This assessment, provided by Rossiyskaya Gazeta the other day, was confirmed by those who took part in the farewell ceremony. A briefing was held on board, attended by officials with the Military-industrial commission under the Russian government, United Shipbuilding Corporation, the Ministry of Industry and Trade of Russia, the Federal Service for Military and Technical Cooperation, Rosoboronexport, heads of the Sevmash shipyard, Severodvinsk and Archangelsk Region administrations. At 3:50 Moscow Time, several trailers towed the vessel from the fitting-out wharf through the Nikolskoye estuary of the Northern Dvina river, along the outlet canal and towards the entrance buoy, in order to pass through the shallowest places at high tide. In other words, the born-again ship was towed the first 15-18 kilometres (not miles) – it could not have been otherwise given its draft in the shallow waters of the White Sea. That is why they will start pumping fuel into the INS Vikramaditya tanks at sea, from a fuel ship. The ship will take about 24 hours to take on enough fuel. Then the vessel will start up its new boilers and main propulsion system finally to sail under its own power. The trials are expected to take an estimated 124 days. 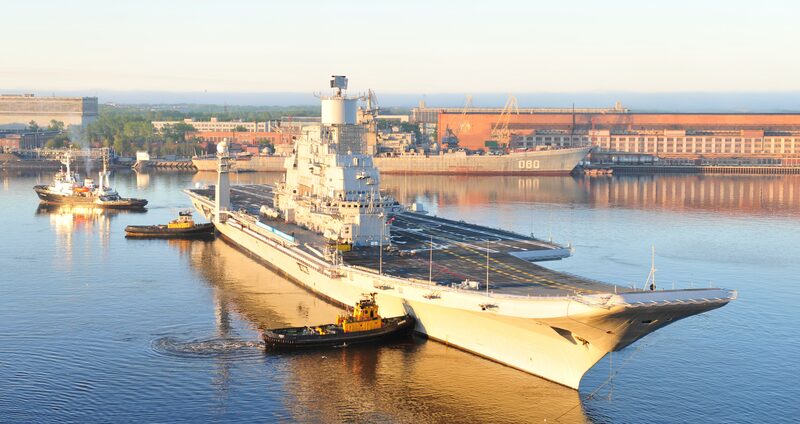 During the first two weeks, INS Vikramaditya will undergo trials in the White Sea; after that, the ship will move to the Barents Sea to test the operability of its deck-based aircraft. INS Vikramaditya delivered to the White Sea for sea trials On Friday morning, at the designated time, INS Vikramaditya was towed to the White Sea and anchored 15 miles off the Sevmash area, where the ship had been repaired and modernised under a contract with the Indian Navy. Over the next 24 hours, the aircraft carrier will take on the requisite quantity of diesel from a fuel ship and start sea trials. Under the package interstate agreement signed in New Delhi back in January 2004, the hull of the aircraft carrier Admiral Gorshkov was handed over to the Indian side free of charge on the condition that Sevmash shipyard would modernise the ship and that INS Vikramaditya would operate a Russian-made air wing. Since then, Nevskoe Design Bureau, Sevmash and contractors have performed an impressive amount of work. The ship has been equipped with a flight deck and a ski-jump for MiG-29K fighters. The upgraded hull has been modified to perform new tasks effectively and is packed with state-of-the-art equipment, systems and mechanisms. The ship has acquired more than 2,000 kilometres of new cable passages. Along with the new name – INS Vikramaditya (”Omnipotent”) – the ship has also received new navigation and radar, communications and air control systems. It is essentially a new ship with a displacement of more than 45,000 tonnes, a length of 283 metres, a width of 59.8 metres, a 30-aircraft deployment capacity and a crew of 1,924. According to Indian experts, once the ship has been handed over to the Indian Navy (in December 2012, according to the original plans), India will reach a whole new level of combat capability, exceeding that of any other navy in the region.